His name is Kyle Kashuv. He's 17. And he's the director of high school outreach for Turning Point USA, a pro-Trump group. 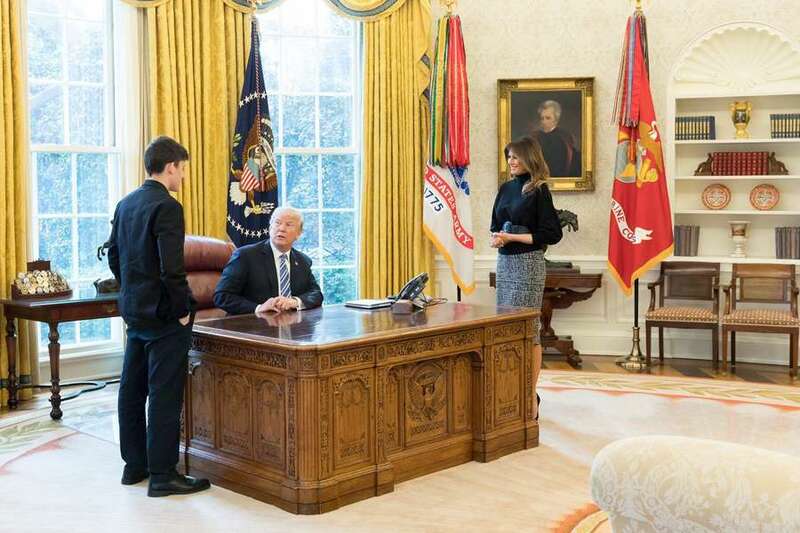 President Donald Trump and Melania Trump meet with Kyle Kashuv in the Oval Office. MUST CREDIT: This photograph was taken by a White House staff photographer and provided by the White House. A crowd of 800 teenagers, caffeinated on colorful Starbucks drinks that did not appear to contain coffee, sprang to their feet as Kyle Kashuv, the 17-year-old conservative Parkland student who gained a national following as a counterweight to the March For Our Lives, emerged on stage. "Guys, we have a surprise for you," Kashuv said as the riff from AC/DC's "Thunderstruck" played in the background. "You know what that means?" "David Hogg?" one student shouted back. "We have shirts. We have shirts! We. Have. Shirts!" Kashuv replied, flinging T-shirts into the frenzied crowd like Frisbees. Kashuv was in Washington last week for the culmination of months of work with the pro-Trump group Turning Point USA, where he now serves as the director of high school outreach. The teenagers in attendance at the group's high school leadership conference at George Washington University had already been treated to a host of big-name conservative speakers invited by Kashuv, like Attorney General Jeff Sessions, U.N. Ambassador Nikki Haley and former White House communications director Anthony Scaramucci. Instead of giving a talk to the students, Kashuv took questions. One student who described herself as being from a "deep blue" part of Connecticut asked Kashuv what it was like dealing with liberal teachers at Marjory Stoneman Douglas High School. "A teacher tried to give me like an 89.4 and purposely gave me one point lower on a quiz to an 89.4 so I couldn't get an 'A' in the class," Kashuv replied. "But I power-moved her. I went to the administration and we made it happen." Another asked him, what is his favorite dinosaur? "T-Rex," Kashuv said, before pausing and declaring his affinity for triceratops instead, prompting a smattering of jeers and cheers. Turning Point USA founder Charlie Kirk, a 24-year-old conservative who gained fame for protesting what he sees as liberal bias on college campuses and who was barred from speaking on Stoneman Douglas' campus after the shooting, said Kashuv's involvement with his group has given it more prominence within the conservative community, and it has benefited massively from Kashuv's work to get dozens of Trump administration officials, members of Congress and celebrities like Mark Cuban to attend the conference. "All the credit goes to Kyle," Kirk said. "We're nothing but an infrastructure that's helped make this possible. We are a movement, don't get me wrong, we were doing this before, but Kyle comes in and brings it to the next level. The energy, the enthusiasm, the speakers. He put his time, his talents behind this, and that's a great partnership because we both benefit from this." Kashuv continues to talk about school safety and his support for the Second Amendment six months after the nation's deadliest high school shooting and has appeared on TV dozens of times, but he's branched out politically after successfully lobbying for a school safety bill in Congress earlier this year. "He's done an amazing job," Scaramucci said, also emphasizing that his short term as White House communications director that ended after a vulgar rant recorded by a reporter was 11 days, not 10. "I think Kyle's voice frankly is a much needed voice because it fits into a narrative of school safety, but recognizing that the founding fathers of our country wanted people to have the right to bear arms. I applaud all of these kids though." In the short term, Kashuv's political work is devoted to Rep. Ron DeSantis' Florida gubernatorial campaign. He's a supporter of the pro-Trump congressman and frequent Fox News guest in the Republican primary against Florida Agriculture Commissioner Adam Putnam. "DeSantis is going to make schools safer. He's going to arm our schools and push single-point entry," Kashuv said, adding that he "wasn't a big Putnam fan" from the beginning but especially not after it was revealed that Putnam's office didn't complete gun background checks for a year. After the November election, Kashuv plans to focus on his college search and the "quite insane" race for class valedictorian. He took five Advanced Placement tests this year, getting decent scores despite missing weeks of class, and plans to take seven AP classes next year. "Hopefully Harvard, that's my goal," Kashuv said. "I'm also gonna apply to UCLA, UC Berkeley, the most liberal hotspots you could possibly imagine." Kashuv said that choosing to speak out as a conservative voice after March For Our Lives activists like Hogg and Emma Gonzalez became famous gun-control advocates was tough. His family didn't initially support him, and he almost shut down his Twitter account once he reached 1,000 followers due to harassment he received online. "Coming out and speaking out, there was no one helping me, no one driving me, no one paying for my flight tickets, there was no one telling me who to email or how to email. I was solo, I was truly solo," Kashuv said. He then started messaging various politicians like Florida Sen. Marco Rubio and arranged multiple trips to Washington, where he eventually met Trump and lobbied Republicans and Democrats to pass the Stop School Violence Act. After a few weeks, conservative pundits Ben Shapiro and Guy Benson reached out to offer him guidance. Kashuv accepts the criticism he receives as a public face for young conservatives, even though he isn't yet an adult, because he is advocating for public policy and lobbying to get certain lawmakers elected. He thinks the activists on the other side of the debate don't get enough pushback from the media when they make hyperbolic arguments or get something factually incorrect. "When you're pushing policy, the protections as a kid are gone," Kashuv said. "I'm rightfully not granted that. I think even David and Emma truly … want to stop gun deaths and school shootings and that shouldn't be delegitimized, ever. They want the same end result that I do, they just do it through different means. " In addition to Kashuv, Parkland students Patrick Petty and Hunter Pollack, whose sisters lost their lives in the shooting, attended the Turning Point conference, along with 30 Stoneman Douglas students who had their transportation and lodging covered by Turning Point. The conservative students in attendance had already generated headlines and controversy when they started a "lock her up" chant in reference to Hillary Clinton while Attorney General Sessions was on stage. "I perhaps should have taken a moment to advise them that … you're presumed innocent until cases are made," Sessions said two days after his speech, in which he laughed as the chant began and didn't attempt to stop it. The controversy was red meat for the students in attendance, who argued that headlines from some media outlets that said Sessions joined in the chant amounted to "fake news." And as Kashuv discussed how he ended the careers of four people who attacked him on Twitter in the past few months, a Turning Point staffer whispered in his ear. He needed to pause the interview to introduce the next speaker, Education Secretary Betsy DeVos. "There's something really, really special about this kid who is probably the most hated pro-gun advocate at the time besides [NRA spokesperson] Dana Loesch," Kirk said. "I invited him to come join me to come speak to protesters and he instantaneously agreed. He was a very effective juxtaposition to the other gun control advocates who are still out there from Parkland."